The Superfund specialist — an expert in how contaminants move in the environment — has been a source of consternation for Gov. Rick Snyder’s administration since October, when he told a radio program that his grave concern about the public threat of chemicals known as PFAS drew a tepid response from his bosses. Officially called perfluoroalkyl and polyfluoroalkyl substances, the group of chemicals had been used to manufacture everything from Teflon and Scotchgard water repellent to firefighting foam. Early research suggests a link to a litany of health conditions from the chemicals that don’t break down in the environment. Now a national concern — particularly at military bases – PFAS has been detected at 31 sites in 15 Michigan communities and counting. In some cases PFAS has seeped into drinking water. Michigan has ramped up its PFAS efforts over the past year, drawing kudos from some scientists and environmentalists. But an MLive report Tuesday that Delaney first documented concerns in a 2012 report — long drawing inaction — has unleashed a torrent of criticism from environmentalists and folks living in PFAS-tainted communities. “The state sat on a public health crisis warning for over five years,” Anthony Spaniola, a Troy attorney who owns a cottage on Van Etten Lake in Oscoda, told Bridge Magazine. “In reacting, the state was unprepared, made serious mistakes, and continued to keep the public in the dark as much as possible,” Spaniola added. 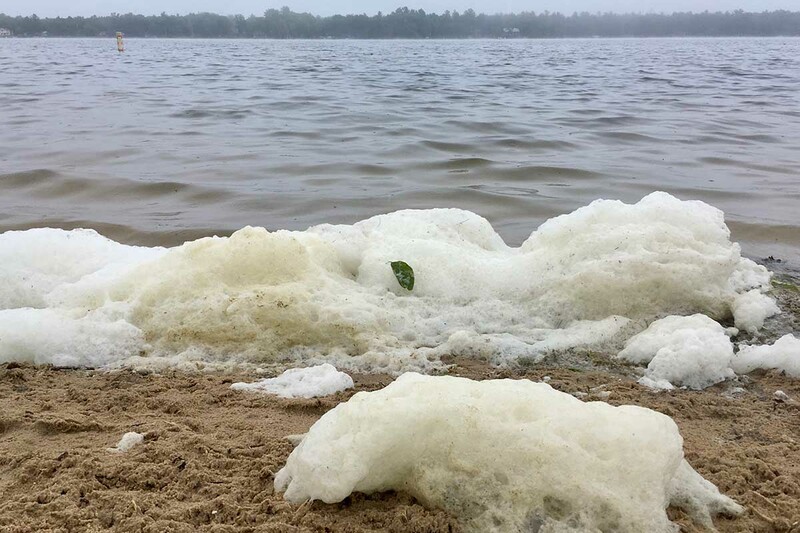 Oscoda, a northeast Michigan tourist destination, is where PFAS from fire suppressants at the shuttered Wurtsmith Air Force base has leached into drinking water and bubbled into toxic foam that’s washed onto beaches. 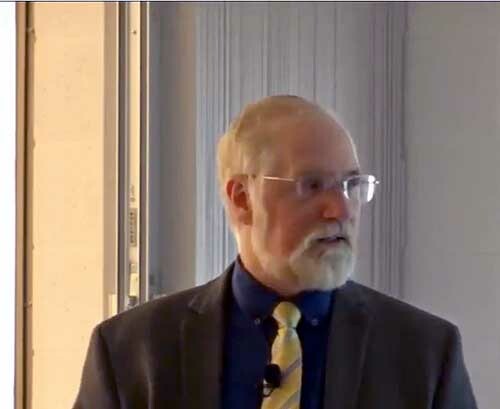 Robert Delaney, Michigan Department of Environmental Quality Superfund specialist, raised concerns about PFAS dangers as far back as 2012. Delaney told Bridge Magazine that, while he has been frustrated with the DEQ’s pace, he appreciates the state’s recent progress. “Nobody goes into politics because they’re concerned about the environment,” he added, referring to the state’s elected leaders. Snyder, a Republican, formed a multi-agency “Michigan PFAS Action Response Team (MPART) in November, and the Legislature appropriated more than $23 million for the PFAS response a month later. And the DEQ started testing all public water systems and schools that tap well water for the chemicals. Michigan also sued Wolverine Worldwide, known for its Hush Puppies shoes, following revelations that toxic chemicals leached from the dumping sites in Kent County. The state has also provide alternate water supplies in some communities. “The State of Michigan takes this issue seriously and is one of the first states in the nation to establish a clean-up standard for PFAS in groundwater used for drinking water,” a state website says. Critics wonder where that urgency was when Delaney first raised alarms as early as 2010, shortly after he learned of the PFAS threat at a U.S. Department of Defense training session. In an email to a former DEQ division chief that year, Delaney said PFAS would likely be a "very important and problematic contaminant" in Michigan, according to the MLive report. Delaney noted research linking exposure to neurological problems in animals, and suggested Michigan should track PFAS research statewide, the news report said. “Not only are human populations exposed to these contaminants, but also there is widespread exposure to the nation’s and to Michigan’s ecosystems by these chemicals,” the researchers wrote. Contaminants from the PFAS family “are contained in the blood serum of virtually every Michigan citizen,” the report said. In his report and elsewhere, Delaney offered more than 30 recommendations. "Virtually all" have been addressed in some way, said Scott Dean, a DEQ spokesman. Critics note many of those actions came only recently — largely over the past year. The DEQ didn’t post Delaney’s 2012 report online until after MLive requested it through the Freedom of Information Act, and the agency did so quietly. Just weeks before Snyder launched his response team, Delaney, sitting beside his lawyer, discussed his PFAS research on the air with Steve Gruber, a conservative radio personality based in Lansing. "I don't know what happened to the report afterwards,” he told Gruber. I gave him the report. I did learn later he distributed it to other upper managers at DEQ." “The fact that this report was withheld from the public for six years is completely unacceptable and a clear failure of government,” Lisa Wozniak, executive director of the Michigan League of Conservation Voters, said in a news release. Dean said "Michigan has moved faster than any state in addressing PFAS contamination." "We moved quickly to protect people from potentially unsafe drinking water in communities with known PFAS contamination from historic industrial or military activities," Dean said. Dean added that Michigan is ready to assist local governments in investigating PFAS and will take action against polluters. "We have also pressed federal agencies like the EPA to accelerate rule-making and standard setting for this emerging class of contaminants," he said. Delaney’s radio interview appears to have complicated his life at DEQ. The agency subsequently curtailed his accessibility to the media — initially turning down Bridge’s interview request before a reporter talked to him at a public event. “This has been a very awkward time for me because of the way things played out. After a 33 year career working for the Department, I kind of thought I would ride quietly off into retirement,” he wrote to DEQ director Heidi Grether in January, correspondence that Bridge obtained through a Freedom of Information Act request and was not previously reported. Delaney was responding to an email from Grether that summarized the agency’s response to the 2012 report. “A number of recommendations contained in your report are not within DEQ’s authority to implement, but state government all the way up to the Governor is engaged and actively working to identify and mitigate potential threats to public health,” she wrote. “I want to say, I am so very impressed by the thoughtful approach the state agencies and the Governor’s office have brought to the issue,” Delaney wrote. Delaney told Bridge that a bureaucratic squabble isn’t the most important narrative associated with PFAS. The biggest story, he said, is that America hasn’t learned from its environmental sins decades ago. I'm sure it's a complete coincidence that the entire state will need to buy bottled water from nestle . So what new Snyder the sanke hates Michigan and is out to destroy our state like he did Flint!!!! Kudos to Garret Ellison (2017 MI Press Journalist of the Year) of the Grand Rapids Press mLive for his amazing, persistent reporting on this issue. Almost always, it's the political appointees who are ethically challenged. The political appointees put the public image of the governor and his party ahead of public health. It's see no evil, hear no evil, speak no evil. The report should have been posted to the DEQ website immediately. So much for the “Pure Michigan” ad-phrase. From its inception, the Snyder administration has not hidden the fact that its priority is to promote the interests of corporations. They cut revenue sharing while cutting business taxes, which has hurt every local government--and every resident--in Michigan. In Flint, the state's priority was to risk residents' health in an attempt to save a little money, while DEQ's priority was to pretend that everything was okay and the folks in Flint were nuts. And now, we learn that (the same administrators at) DEQ knew six years ago that there was another danger lurking in the groundwater--but ignored it. It looks like the main mission of the DEQ throughout the Snyder administration has been to cover up for industry while lying to the public. Please do tell us which company Snyder or the state was trying to help by switching Flint's water source, or whose money would've been saved. KWA Bondholders (Snyder backers) stood to lose a boatload if Flint didn't sign on to the KWA. Continued malfeasance in office by the Governor. Teflon and Scotchguard apparently have Pfas chemicals in them. Are products made with Teflon and Scotchguard dangerous? Is it still OK for 3M and others to use Pfas chemicals in the manufacture of various products? Is groundwater contamination our only worry with these chemicals? Thank you for this piece. There must be a comprehensive coordinated range of simultaneous actions by DEQ, Attorney General, citizens, Depatif Public Health, including Part 201 strict liability, class and individual cleanup, restoration of groundwater and natural resources damages, medical monitoring, personal damages: lawsuits, agency enforcement, agency response orders, leadership, and immediate restoration of polluter-pay, local community response teams, transparency, reporting retroactively and future by all who have used in past 20 years. In addition, legislature must fill in gaps in law. Art 4, Sec 52 State constitution imposed mandatory duty on legislature to prevent pollution if our waters. Art 4, Sec 52 imposes similar duty to protect public health. These duties have been turned upside down and breached by state leaders.